With Valentine's Day fast approaching, it's time to break out the romantic movies. Unfortunately, these 11 romance movies have no heart. This week's DVD releases feature comedy, horror, thriller, and drama. Blu-Rays include the fourth movie in the Underworld series, and Tim Heidecker and Eric Wareheim's first stab at the big screen. The Vow Quotes: You Know Who I Am, Right? Few genres of film give us so many good movie quotes as the romance and The Vow is no different. After winning the weekend box office, we present the best of The Vow quotes. The Vow led a record-breaking weekend at the box office as all four new films earned more than $20 million. The Channing Tatum and Rachel McAdams romance led the pack with over $41 million. Channing Tatum and Rachel McAdams are inspired in The Vow. The romance film works on so many levels you will be thrilled you took The Vow this Valentine's Day. This Means War will not wage a battle against the romance picture The Vow this Valentine's Day. The film is returning to its original release date of February 17. Channing Tatum and Rachel McAdams are talking about The Vow. 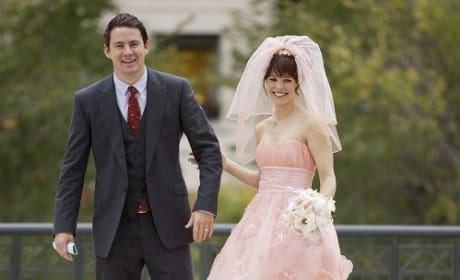 The romance film may look like a Nicholas Sparks book, but The Vow is all original. A happy couple gets into a car accident shortly after their wedding and the wife (Rachel McAdams) winds up in a coma. She eventually wakes up, but has no memory recollection at all and can't even remember her husband (Channing Tatum). He proceeds to win her back by showing her how much they loved each other.